After five generations of Duck breeding and growing experience beginning on Long Island in 1858, Culver Duck relocated to the heart of Indiana Amish Country. Here the care of ducklings is usually a family affair on surrounding Amish farms. We're now in our sixth generation; and, our family has become a major supplier of gourmet quality duckling to fine restaurants and specialty stores worldwide. 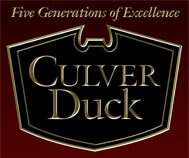 Culver Duck raises and processes approximately 3.5 million ducks annually. Products include duck breasts and cooked duck halves in five flavors, as well as a variety of duck sausages.